This photo, posted to the website Reddit, claimed that Greg Muzzy, 45, had received lungs from victims of the Aurora, Colo., theater shootings. However, officials said that's not true. The coincidence seemed too real to ignore. 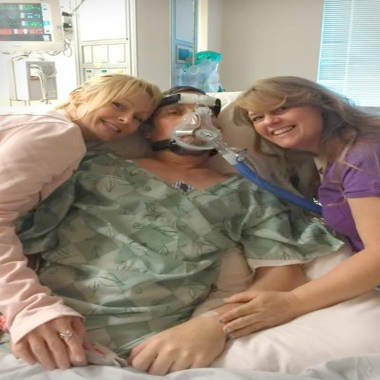 Early last Friday morning, within an hour of the horrific movie theater shooting that killed 12 in Aurora, Colo., the Dallas family of a man waiting for a double lung transplant got a call saying the scarce organs were suddenly available. The news quickly spread, both within the family and online, after an excited cousin, Lucas Massey, 18, posted a photo of a recovering Muzzy on the website Reddit. More than 2.2 million people viewed the photo and more than 2,000 comments poured in. News sites including the HuffPost Living Canada and the British tabloid the Mirror ran stories touting the transplant. “A feel good story has some out of the Aurora massacre,” the HuffPo story read. Trouble is, it isn’t true. Greg Muzzy, a former construction worker from Wichita, did get his lungs in a successful operation on Friday. But the donor wasn’t in the Aurora movie theater early Friday morning, hospital and transplant officials said. “We can tell you that those lungs did not come from Colorado,” said Pam Silvestri, public affairs director for the Southwest Transplant Alliance in Dallas. A spokeswoman for UT Southwestern Medical Center, where Muzzy was treated, said the same. It’s not clear whether any of the 12 victims of the movie theater shooting were organ donors. That information is confidential, said Jennifer Moe, communications director for Donor Alliance, the organ procurement organization, or OPO, in Colorado. Ten of the victims -- those who died in the theater -- likely would not have been eligible to be solid organ donors because their bodies remained so long at the site, more than a dozen hours in some cases, because of the police investigation. Nor would they have been able to donate corneas or living tissue, which must be recovered and preserved within 12 hours of death, said Robert Austin, spokesman for the Rocky Mountain Lions Eye Bank in Aurora. In general, organs such as the heart, lungs and kidneys remain viable for only about an hour after circulation stops, said Dr. John Friedewald, a kidney transplant expert with Northwestern Memorial Hospital in Chicago. The Arapahoe County Coroner's office confirmed that two victims were taken to area hospitals, where they later died: Jessica Ghawi, 24, and Veronica Moser-Sullivan, 6. Their organ donation status remains unknown. Silvestri, the Dallas expert, understands the confusion. Whenever there’s a mass tragedy, recipients of donated organs often assume that’s the source. “People think they know where they come from and they just don’t,” Silvestri said. Muzzy’s sister, Tami Teeples, never said the family was certain the organs came from Aurora. On Sunday, before the situation was sorted out, she told NBC News they were grateful no matter the source. Muzzy suffers from a worsening form of genetic emphysema in which people have too little of a vital protein called Alpha-1 antitrypsin circulating in their blood. He’s become gradually weaker and more debilitated in recent years, to the point that he had only 7 percent of lung capacity, his sister said. In March, doctors said a lung transplant was his only option. “They said, ‘You need to say your goodbyes,’” Teeples said. In June, she moved her brother from Wichita to Dallas and helped him get on the local lung transplant list. They were waiting until last Friday, when the call came through just after midnight. “My mom came into my room and said: ‘We have lungs,’” Teeples recalled. If averages bear out, those lungs were among five allocated per day in the U.S., and some 1,822 transplanted last year, according to Anne Paschke, spokeswoman for the United Network for Organ Sharing, which tracks donation data. Overall, some 114,651 people are waiting for organs now, according to statistics from the Organ Procurement and Transplantation Network. Most of the donations come from everyday tragedies, the private deaths that receive no national news attention, no presidential condolences. That’s the message that Muzzy’s family would like to share, said his sister. Blood glut in a disaster: Too much of a good thing?